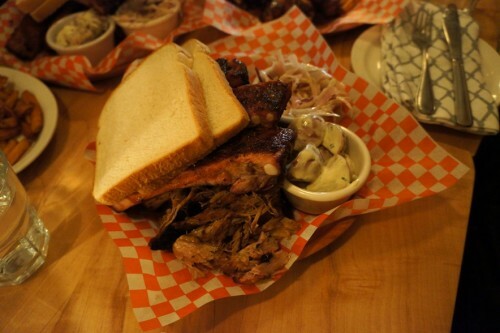 BBQ seems to be all the rage these days in Toronto as BBQ joints keep popping up around the city. Having heard great things about Aft Kitchen & Bar (@aft_bar) at Queen and Broadview, it was just a matter of time before we popped in. This tiny restaurant opened up about a year ago and has been going strong ever since. But given its size limitation, it’s not the greatest spot for large groups since they don’t take reservations. Our group of five arrived on a Saturday at 6pm and waited around half an hour for a spot that could accommodate us (nearly half of the seating is bar-style). During our meal, there was a constant crowd waiting for a table. I recommend coming early as their popular items seem to run out. 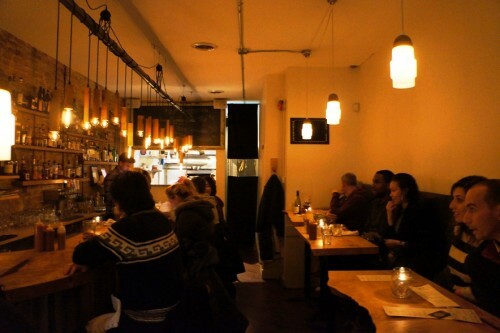 The exposed brick wall down the bar, dim pendant lighting and reclaimed wood tables make it a warm and cozy space. Aft also has a backyard patio so it’s definitely something to look out for when the weather gets a little better. While Aft specializes in BBQ, their weekday dinner offerings are slightly different from their weekend BBQ options. So, check their menu online before deciding which day to drop by. They also offer a tempting brunch, if that’s your thing. 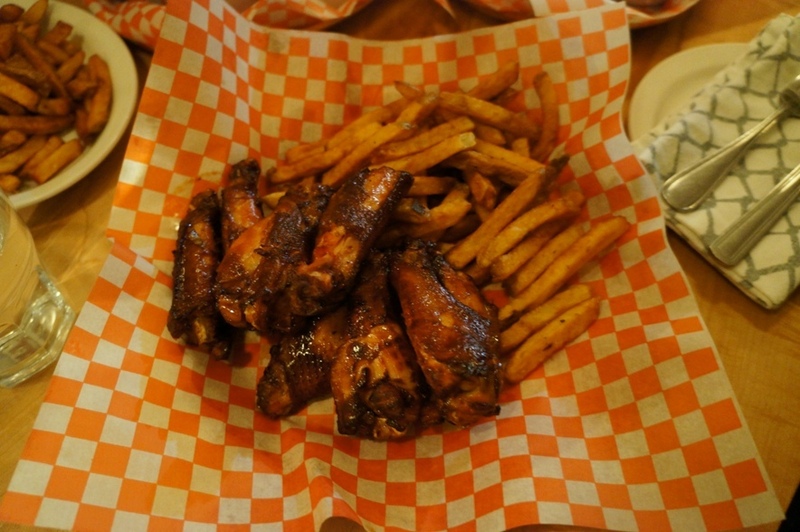 We started off with an order of Smoked Chicken Wings – with house BBQ sauce served with fresh cut frites ($14). You have the option of getting them as is or “skinny dipped” which means they take the same smoked wings and toss them in the fryer quickly to give them a bit of a crisp exterior. We chose the skinny dipped version, of course. Aft’s chicken wings are first brined and then smoked. They had a really lovely smokiness to them and while the quick fry didn’t provide as much of a crisp exterior as I would’ve liked, they were still some damn good wings. Served with a pile of ridiculously addictive fries, an order of wings certainly eats like a meal. 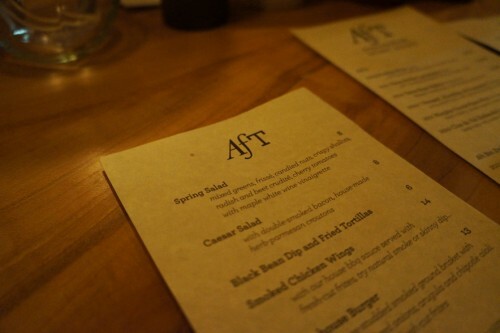 Aft offers five items on their weekend BBQ menu. If you like variety, you can get a platter for one ($22) which includes any two BBQ choices with two sides or a platter for two ($33) which includes any three BBQ choices with three sides. 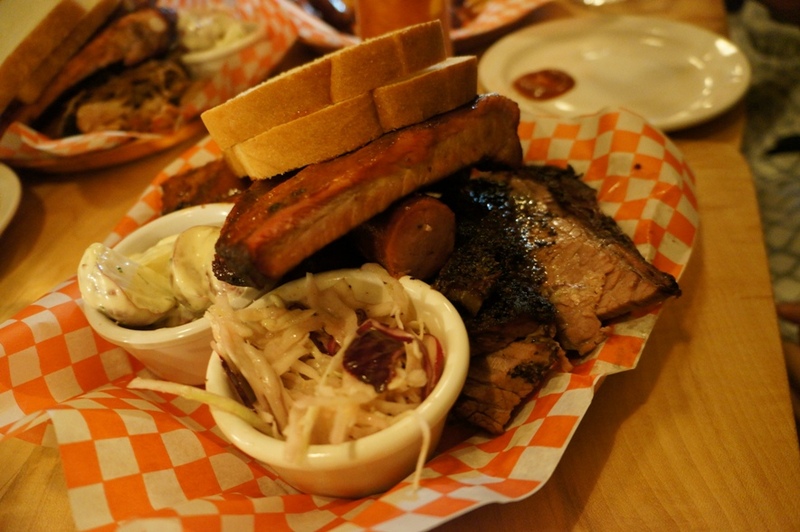 Sides include coleslaw, fresh cut frites, roasted potato salad and cowboy baked beans. 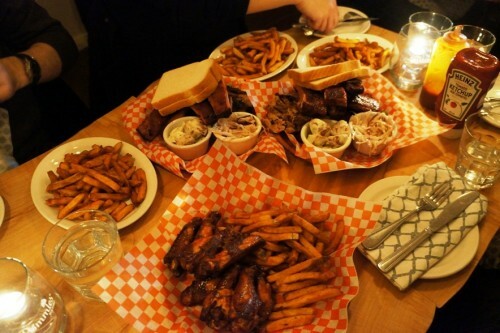 Since there were five of us, we decided to share two platters for two. Our first platter consisted of Texas style BBQ Brisket (slow smoked), BBQ Side Ribs and Country Sausage. The first thing I bit into was the Texas Style BBQ Brisket. I’m not always a big fan of brisket since more often than not it turns out quite dry. But Aft’s brisket was fantastic – incredibly tender, fatty and moist. Take a slice, slap it onto some Wonderbread with some pickled onions and you’ve got yourself a perfect bite. If you’re a rib fan, you better get here early. By 8pm they had already run out and it’s not hard to see why. These moist and meaty ribs had a lovely bark to them and had a really great smoky flavor to them. They weren’t fall-off-the-bone tender but that’s just not their style. 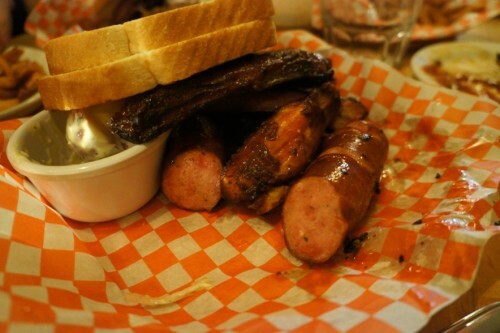 The third component of our first platter was the juicy Country Sausage. Was it tasty? Yes. But was it memorable? No. The other platter for two we ordered consisted of the same BBQ side ribs as the first platter, BBQ Chicken and Pulled Pork. The BBQ Chicken was wonderfully moist, saucy and delicious. It was just a little hard to share amongst the five of us since it only came with a drumstick and thigh…and everyone seemed to want more. Some people at the table declared it their favourite of the evening. As for the Pulled Pork, on its own, it didn’t wow me since it came out au naturel (aka without any sauce). However, it was easily rectified with some of their delicious sauces. 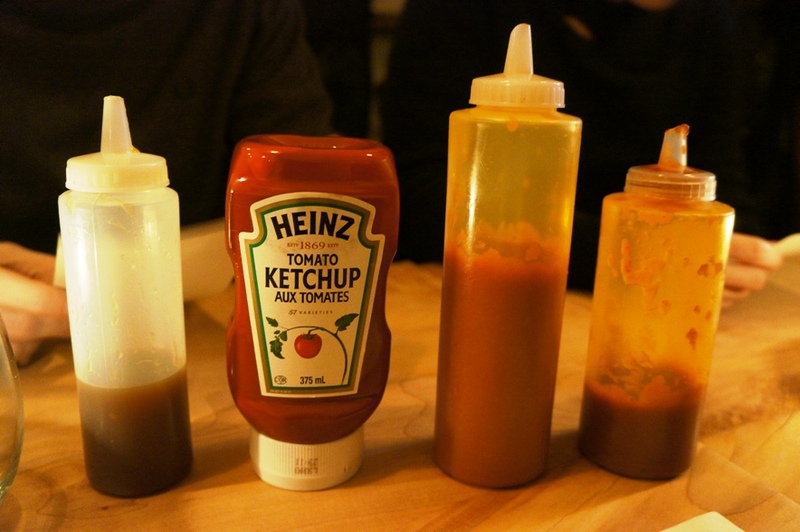 Aft offers three sauces – mango BBQ, a smoky BBQ and maple habanero. I was in love with the mango BBQ sauce which was ever-so balanced. You could definitely detect the sweetness but it wasn’t at all overpowering. None of us at the table are particularly fond of beans, so our sides consisted of the potato salad, frites and coleslaw. 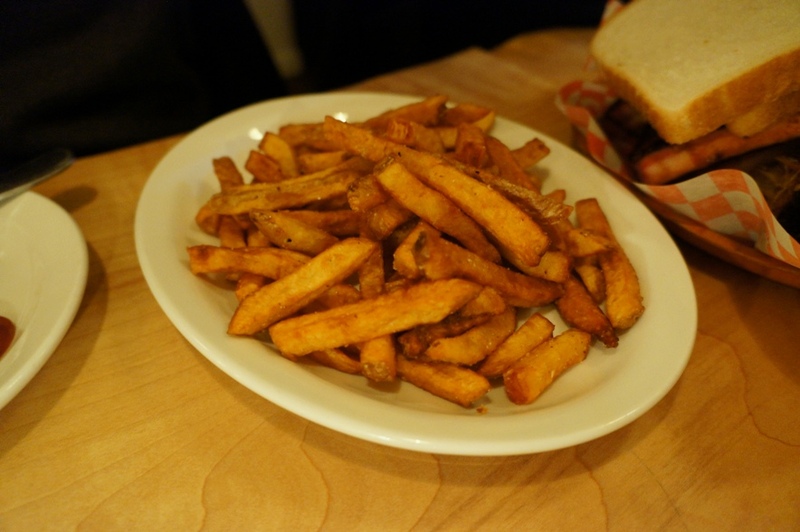 We all enjoyed the fresh cut frites the most. They were crispy, not too thick or thin and were seasoned perfectly. I recommend dipping them in some of the mango BBQ sauce – delish! The coleslaw and potato salad were solid but they were quite small in portion compared to the enormous mountain of fries. 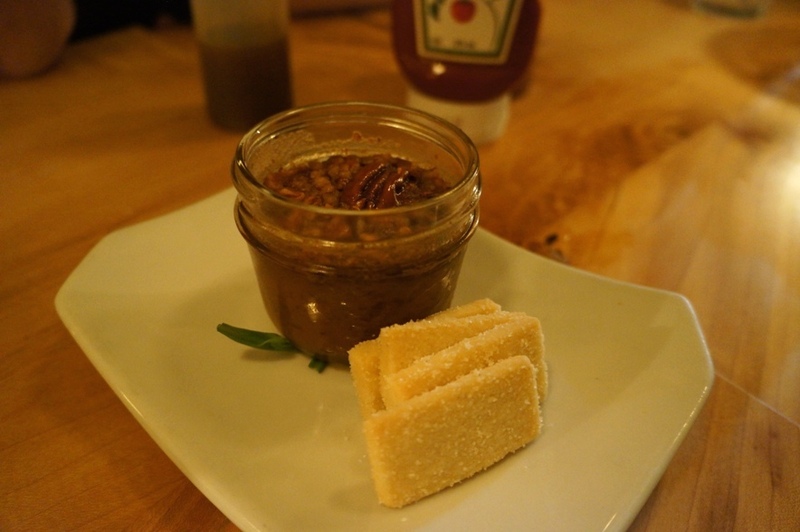 For dessert, we shared the Deconstructed Pecan Tart ($7). We also wanted to order the sweet potato pie but unfortunately they were already sold out. Anyway, the deconstructed pecan tart arrived in a cute little mason jar and was just enough for everyone to take a bite. It was quite bourbon-y and a little too sweet for my liking. However, I loved the shortbread that it came with. 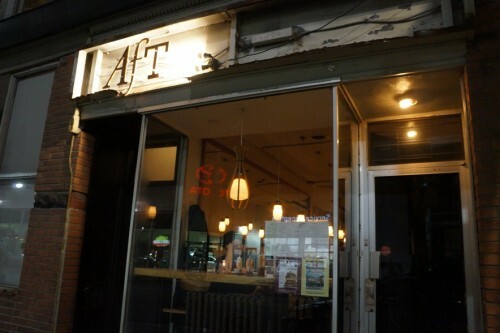 Overall, we had a great meal at Aft. The best part is, we ordered a ton of food and left with satisfied stomachs for just under $100 between the 5 of us (pre-tip). If you’ve got the BBQ bug, Aft Kitchen & Bar will definitely satisfy your craving!